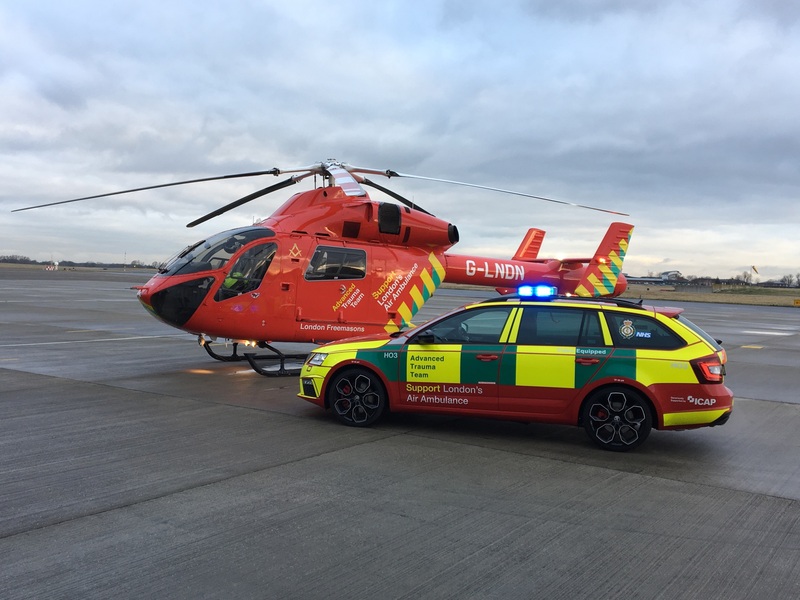 London’s Air Ambulance, the charity that delivers an advanced trauma team to critically injured patients in London, has today unveiled its new fleet of ŠKODA rapid response cars. The charity’s cars operate at night or in adverse weather conditions, bringing the same doctor-paramedic team, equipment and drugs to a patient’s side as the charity’s aircraft. The update to the fleet means that the charity will continue to operate at the highest levels of efficiency and safety. The new fleet will continue to use three ŠKODA Octavia Estate vRS cars, now updated to new models to ensure service delivery. In addition to being fast, robust and fitted with additional safety features for blue light driving, the cars now have an extra 15BHP, an electronically controlled limited slip differential and 19in wheels. The fleet also sees the arrival of two new ŠKODA Kodiaq Estates, which have increased space to accommodate more medical kit. The charity has worked with ŠKODA for a number of years to ensure its rapid response vehicles meet the needs of the service. Jonathan Jenkins, CEO of London’s Air Ambulance, said, “Our charity aspires to provide urgent care to a critically injured patient care whenever and wherever we are needed. By replacing our rapid response cars and ensuring maximum reliability, safety and speed, we make sure that we can achieve this mission. While the helicopter is the most efficient way of getting to our patients, our cars ensure 24/7 coverage for London and are a critical part of the capital’s emergency infrastructure. In 2017 it was our rapid response cars that delivered our advanced trauma teams to the major incidents at London Bridge and Grenfell Tower. The cars patrol across central London so they are in prime position to be dispatched anywhere within the M25 at any time. Dispatch occurs from the London Ambulance Service (LAS) Emergency Operational Centre by a London’s Air Ambulance advanced trauma paramedic, who monitors up to 5000 medical 999 calls that are received by LAS each day. They are looking for those people who are so seriously injured that they need London’s Air Ambulance’s medical expertise before they reach the hospital. The cars are driven by the service’s paramedics and navigated by an advanced trauma doctor. A bespoke dispatch app ensures that the crew get to a patient as quickly and as safely as possible. London’s Air Ambulance has its own internal advanced driving instructor to prepare the team to drive the cars under blue light conditions during the day or night.